iiNFiNiZE India, now with Fancy Patch Work Cotton Pouf . This is a Vintage Cotton Fabric Patchwork Ottoman Cover In Round Shape. 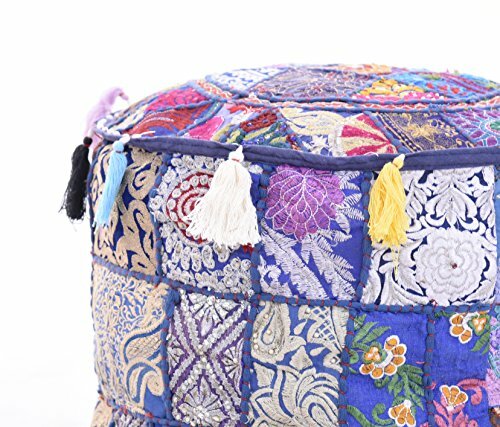 Pouf Cover has Patchwork Pattern. insert is not included. In this cover Vintage patches from old, valuable wedding saris & dresses are patched and stitched together at random to create a collage like effect and decorated with all kinds of colored threads, patchwork, raised colored thread work and embroidery in intricate designs. If you have any questions about this product by iinfinize, contact us by completing and submitting the form below. If you are looking for a specif part number, please include it with your message.